I am not meek, but I am working towards it. Most people would not admit to working on becoming a meek person. We are usually offended when referred to as having too meek a personality or character. Why? 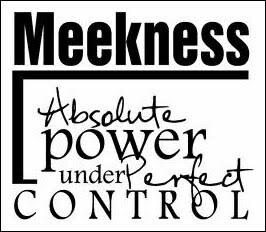 From all that our culture values, to be meek is to be mild-mannered, spineless, weak, submissive, subservient, passive and even in-effective. Meek people get trampled. Maybe we do not understand what being meek is really all about from Jesus’ perspective. Being meek is the middle ground between excessive anger and being completely dispassionate and passive. Anger is not a sin, nor is it necessarily bad. The bible says that we are to be angry, but sin not. Anger can be a great motivator. It can help us to get charged about God’s righteousness and justice. Everyone gets angry. But anger is often a selfish response to the world and other people. If we were left up to our own devices and decisions, everything would be going our way. So what is it that make us angry? We may feel anger when we lose control – when things don’t go as we planned and we begin to feel powerless to change them. We can feel anger when other people’s decision’s adversely affect our lives without our consent. Jesus was meek. But Jesus also became angry. But his anger was a righteous anger for the down-trodden and the oppressed. His heart burned when people called by His name ignored “the least of these, my brethren.” He promises judgment for those who truly hurt children and cause them to stumble. His soul reacted when He saw his Father’s temple being used for profit instead of the worship of God. James 1:19-20 “This you know, my beloved brethren. But let everyone be quick to hear, slow to speak and slow to anger; for the anger of man does not achieve the righteousness of God.” Note that when Jesus became angry, His anger was focused on those that caused suffering to others and on the disrespect shown towards God and His worship. Jesus’ anger was never about Himself. The meek are not easily provoked to anger; they patiently bear and put up with injuries and affronts; they carry themselves courteously and affably to all; they have the best thoughts towards others; they do not envy the gifts and graces of other people, and they are willing to be instructed and admonished. Meekness is patience during the midst of injuries. Meekness produces peace. It is proof of true greatness of soul. It comes from a heart too great to be mowed down by insults. It even prays for those who tear down. He that is constantly ruffled, and raises a storm of passion when wronged, is at the mercy of every mortal that chooses to disturb him. The meek are those who quietly submit to God; who can bear insult; are silent, or return a soft answer; who, in their patience, keep possession of their own souls. To be meek is one who controls his strength and uses it appropriately. You cannot achieve meekness without first achieving humbleness. We submit ourselves to God and know that we can do all things through Him. We humble ourselves into servant-hood…to love, to have compassion, to serve those around us, even those who are against us. To be meek is to be wise…. So, what keeps us from being meek? Ego. So, what’s not to like about being meek? I am not meek either, but since our study on this, I am definitely more conscious of my weakness in this area. I am working on a “it’s not about me” mantra. Oh, that ego. I’m sensing a theme on our blogs this week. 🙂 I struggle with meekness, in learning to be meek and in fully understanding what it is. But as I was reading your post, it occurred to me that becoming meek means dropping my pride. We’ll work together and those with like-minds to become the blessed of the beatitudes Angie. I love how Jesus gave us perfect instruction, we just have to follow it.